A man begins to suspect that the oil company for which he works is swindling its investors. Then he is framed for murder. The mpeg2 file can be loaded into DVDAuthorGUI (a free program) to create a DVD to watch on television. A Man Betrayed is a 1936 American film directed by John H. Auer. Frank Powell (Edward J. Nugent) works selling stock for an oil well. 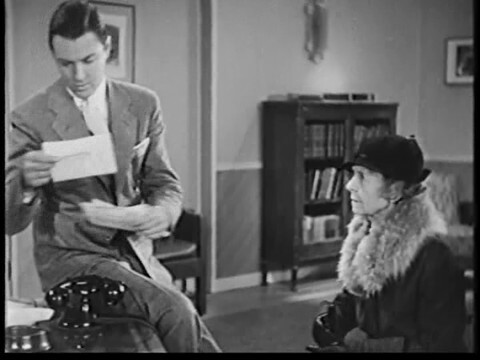 When a client comes to him with a letter from her nephew saying the well is a scam Powell becomes concerned and confronts his 3 bosses Carlton, Richards, and Burns. Feeling he is not getting straight answers he decides to fly immediately to Miami to investigate the wells. Worried Powell might find out the truth that Carlton, Richards and Burns used the investors money to play the stock market, Carlton commits suicide by shooting himself after recording a confession on his Dictaphone. Wanting the $100,000 life insurance Richards and Burns hire Tony Maroc and his gang to set up Carlton's body in Powell's apartment to make it look as if he's been murdered. Powell gets arrested as soon as his plane lands and is tried and found guilty of murder. While being moved to the penitentiary to await execution Powell escapes when the kleptomaniac Gabby, a member of Sparks gang, whom he is handcuffed to breaks out. Powell goes to Burns apartment and threatens him and Richards with a gun. Powell's brother Reverend Curtis (Lloyd Hughes) shows up and together they flee the police and head to Sparks headquarters; a boxing gym. The Police show up and to avoid suspicion Curtis poses as a boxer and knocks out the champion, Roundhouse. His jaw now broken Roundhouse can no longer participate in the upcoming boxing match which Sparks (John Wray (actor)) has bet Tony $4000 on. Sparks tells Curtis he is to take Roundhouses place. If he loses Sparks turns Frank over to the police. However if he wins Sparks will pay Curtis $500. Hiding out at the boxing gym Curtis goes into training. Tony becomes worried Curtis will easily win the fight and gets his girlfriend to chase after Curtis hoping to distract him from his training. When that doesn't work Tony finds out Curtis, who is now wanted for aiding a criminal, is Franks brother and has him arrested. Sparks decides to prove Franks innocents so Curtis will be set free. Sparks, his gang, and Frank go to Franks old apartment to investigate. Sparks proves Carlton couldn't have been shot in the apartment after he shoots of his gun and the neighbors come running. The group then heads to Carlton's old office. While looking around investigators from the insurance company show up saying they're investigating Franks innocents. They allow the gang to continue searching the office after being told they are "crime experts'. On the desk they find marks from where a knife has repeatedly been tossed into the top which leads them to Smokey, a member of Tony's gang who compulsively tosses a knife into wood surfaces. Sparks and 2 of his men interrogate Smokey until he confesses. Richard and Burns begin to move Carlton's things out of his office when they find the Dictaphone roll in which he confesses his guilt and suicide. Richards breaks it to pieces right before 2 policemen show up to arrest the men for Carlton's murder. Richards says Carlton committed suicide to which the police tell him to prove it.